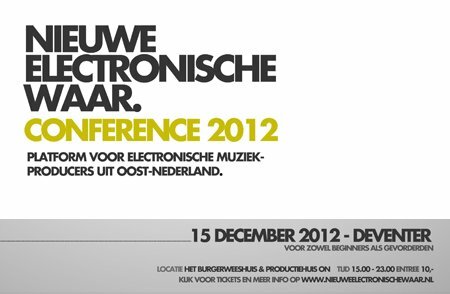 December 15: NEW Conference | Esc.rec. Get to know everything there is to know about producing, getting booked, playing the media, releasing your work and rights management. Get to know everything there is to know about producing, getting booked, playing the media, releasing your work and rights management. On December 15 NEW hosts the NEW conference for the second time. A day packed with masterclasses by well-known producers, panels of music industry professionals and workshops. With Black Sun Empire (producer), Arts The Beat Doctor (producer), Alex van der Hulst (Oor & Nieuwe Revu), Dion Verbeek (Octopus Agents), Thomas Martojo (Dekmantel), Adriaan Muts (Full Spectrum), Jeroen van de Bogert (Alles Los), Camiel Le Rutte (Melkweg), Lars Kelpin (Grap), Theo Ploeg (new media specialist and journalist), Mars Mertens (specialist in music rights and strategy), Mark (Rush Hour), Djordje Petrovic (producer). On this day we also announce the shortlist of tracks that qualify for a spot on our next release: NEW 8.0. This cd will be released online by Esc.rec. again. Read more about the conference here and order you tickets here.